When painting a boat used for hunting/fishing, such as a jon boat, typically a flat finish is desired so you’ll want to use one of our camouflage paints. A primer coat is used to help the paint adhere to the aluminum surface and provides an extra layer of protection from corrosion. Or use or Aluma Hawk that is a paint and primer in one. When using the Camouflage Paint Spray Kit or Duralux Camouflage Paint on bare aluminum apply two coats of Duralux Zinc Chromate after sanding. If using the Aluminum Boat Paint Green or Aluma Hawk (available in Black, Jon Boat Green or Aluminum Grey), these serve as paint and primer in one. For more application details see our ‘how to paint an aluminum jon boat’ article. This should be used when you desire a dull flat finish. If you desire a gloss finish, look to the Duralux Marine Enamel or Super Marine paints for other options. Duralux High Gloss Marine Enamel is affordable and easy to apply and only recommended for above the waterline or moderate use on the bottom (a day or so in the water, not extended periods). This topside paint works best in very thin coats; see the prep recommendations found on product page on “how to use” tab. For aluminum application apply one coat of Duralux Zinc Chromate M739, Top with two full coats of Duralux Marine Enamel. The enamel works well thinned with M650 by Duralux. Aluminum, galvanized and Stainless: Use SM-117 Pre-Wash Primer in combination with any other Super Marine primer such as SM-664D Etching Primer. You have many options when painting aluminum. 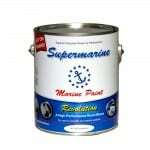 Your use of boat, budget, and amount of time you want to spend on the project determine the right paint for you. For more information see our ‘topside boat paint options’.